The remit at Powergen is to extend Bord na Móna’s generation capacity and to expand its interests in the market. Operating in the wholesale end of the electricity market, the company sells to the single electricity pool established in 2007 by the Single Electricity Market Operator (SEMO). “Outside of this market, we have a major contract with ESB Customer Supply. That’s for the off take of Edenderry,” said John Reilly, head of Powergen. One element of that plan is putting an increased intake system in place at Edenderry Power. “That allows us to increase the intake of biomass and it mitigates against the high moisture content of peat due to the poor harvest,” said Tom Egan, plant manager at Edenderry Power. The plant there remains central to Bord na Móna’s power generation and offers economies of scale to the new peaking plant at nearby Cushaling. “We will utilise a lot of the existing assets and resources at Edenderry Power in Cushaling, including the grid connection, the water treatment plant and the experience of our staff,” said Tom, who is overseeing the development, construction, commissioning and operation of Cushaling Power. This peaking plant offers Bord na Móna the opportunity to maintain wind-generated energy supply. “You can’t store electricity, so you need a thermal plant which burns fuel to create heat which rotates turbines to generate electricity,” said Tom. “The peaking plant is able to start and stop quickly and can make up the deficit in power supply when there is no wind, so it supports our target of putting wind-generated electricity on the system and maintains security of supply. For projects manager Brendan Connolly, it’s a busy period assessing the financial viability of four live projects. The peaking project at Edenderry is under construction and should be operational by end-2010. 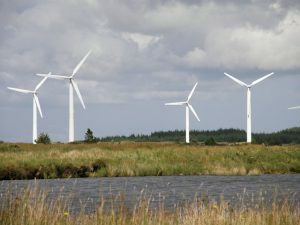 In addition, three wind projects are in process: an 80MW wind farm at Mount Lucas, Co. Offaly, which is subject to the planning process; a 40MW wind farm at Bruncana in counties Tipperary, Kilkenny and Laois; and the 360MW wind farm at Oweninny, Co. Mayo, which expects to get a first stage grid connection. There have been many archaeological excavations on Bord na Móna bogs. Read about them here.